Note: I wrote this post before a cow moose was killed near a Denali National Park Visitor Center by a person exercising his right to defend life/property. While that individual was indeed within boundaries of federal law, much discussion centers around appropriate actions during high numbers of moose-human interactions this summer. AKontheGO believes, and will always believe, the best defense around any potentially dangerous animal is education. Understand the animal, and learn (and practice) the appropriate response. We hope this post offers such, and adds a few more resources to your family’s “critter toolkit” for an Alaska vacation. When it comes to Alaska creatures, the bears usually steal the show, and no wonder. Some 700 pounds of muscle and might that has their own soon-to-be feature film is hard to argue with. But if you’re visiting Alaska, there’s another famous animal who actually needs even more attention. Are you listening, kids? First, the facts. Moose are the largest members of the deer family, and are officially called “ungulates” by scientific types (meaning they have hooves). Big creatures, moose can weigh up to 1,000 pounds and stand six feet high at the shoulder, making them a formidable presence to the unsuspecting visitor. 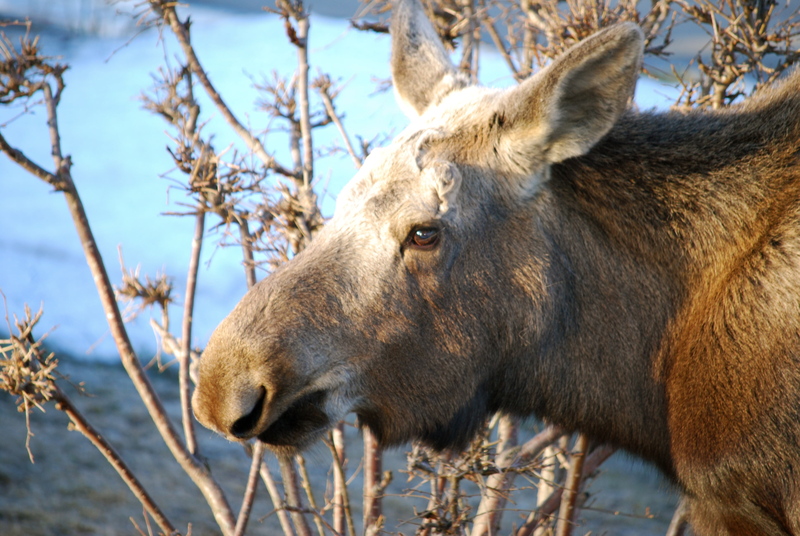 Their range is broad, and they’ll live anywhere with fresh, running water and vegetation like grass, shrubbery, and trees, so moose make their homes in Maine, Utah, Montana, Colorado, Canada, and many areas of southcentral and Interior Alaska, among other places. Winter moose visitor, towering over my four-foot high fence. With a bulbous nose, ewe neck, and long, spindly legs, moose are easily identified over their quaint and delicate deer cousins (in fact, I once read that a moose is a horse made by committee). 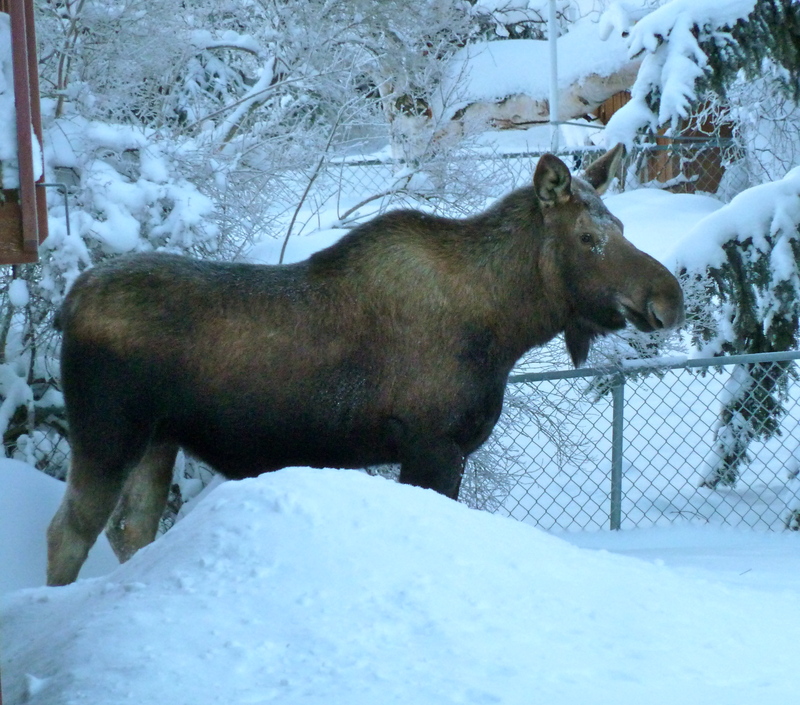 Loving the urban life, moose often migrate into Alaska’s cities during the winter months, when deep snow makes walking difficult, and into yards during the spring and summer, when an abundance of shrubbery and fresh grasses make for easy eating and calving grounds safe from predators. Unfortunately, these same areas are also populated with humans, and sometimes clashes between people and animals mean a sad outcome for the moose. Not “mean” in the same sense as many folks perceive bears, moose can and do become quite agitated when something out of the ordinary appears in their happy bubble of eating, calf-rearing, and resting, and it behooves (get it?) the savvy Alaska visitor to heed our tips for safely vacationing the Far North, especially with youngsters. 1. Know the season. Winter moose are tired and hungry from walking in deep snow for a few sticks of willow, and get angry very easily. 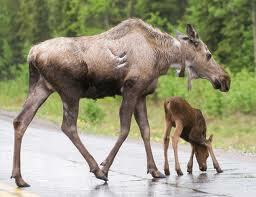 Spring and summer moose are often mamas looking to protect their precious little ones, and are considered the most dangerous. Fall moose are the big daddies, looking for love, and they’ll be full of, um, vigor. Paying a bit of extra attention to your seasonal visit means a better understanding of a moose’s behavior pattern, and perhaps, your exit strategy. 2. Learn the signs. An agitated moose will put its ears flat back against the head, raise the hair along its back, and lick its lips. Sometimes, a moose will “bluff charge” by doing a crazy, forefooted bucking maneuver that means “get the heck outta here, now!” to people. Moose hang out along trails, in yards, and rest in quiet, shady places. They are also often quite easy to miss, so be very observant. Heads up: unlike horses and other hooved animals, moose can kick with all four feet, in all sorts of directions! 3. Take appropriate action. If you see a moose in the distance eating or resting, quietly move away and go a different direction. If a moose crosses your path, stop. Moose always have the right-of-way, and sometimes people need to wait while Mr. or Mrs. Moosen decide which direction they’d like to proceed. Be patient, be wary, and if a moose comes toward you, no matter how friendly it might appear, go the other way. Especially those adorable little calves. Keep children close during all Alaska outdoor activities. If your family sees a moose, remember not to scream, shout, or run up and take a picture for Facebook. 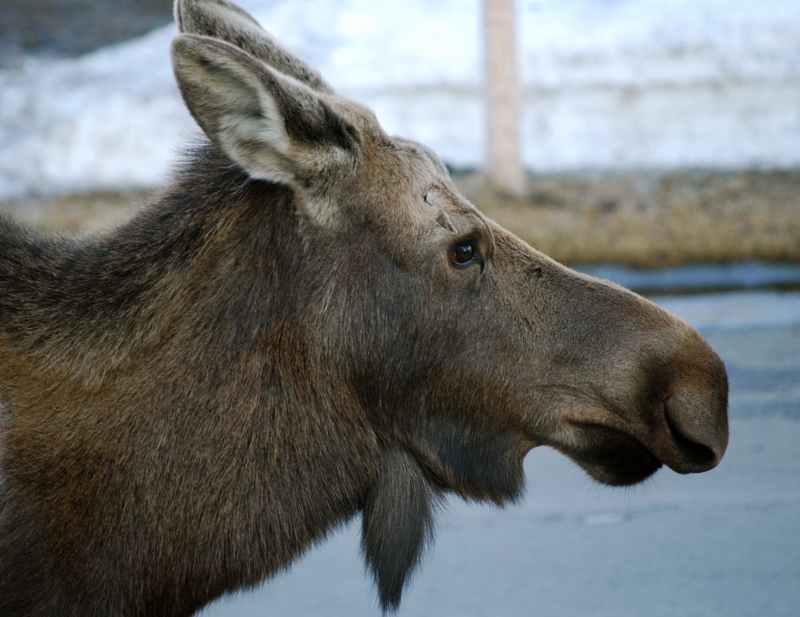 Heads up: A moose weighs 15 times more than the average third-grader. Alaska children are taught from a very early age how to react to a moose on the playground, bike route, or at the bus stop. 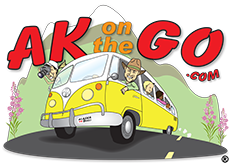 Check out this great video produced by the Alaska Department of Fish and Game, who also have other important tips for visitors and residents of the 49th state. 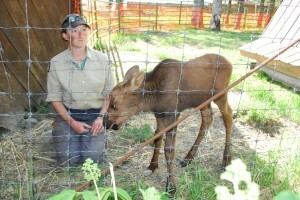 Orphaned moose calf at Alaska Wildlife Conservation Center is cared for by staff. Want to learn even more, and view moose in a safe manner? Try a visit to the Alaska Zoo or Alaska Wildlife Conservation Center. Both offer excellent educational opportunities for families about Alaska’s funkiest, and most fabulous, animal. Posted in Alaska Wildlife Experiences, Health and Safety and tagged Alaska, Alaska Wildlife Conservation Center, Alaska Zoo, Famly Travel, Moose.